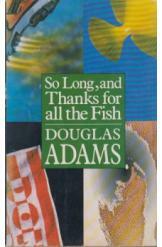 So Long, and Thanks for All the Fish by Douglas Adams, Sci Fi. Book is in good condition, all pages intact. After suffering through three books worth of indignities, Arthur Dent finally gets to see God's final message to the universe. Book 4 of the Hitchhiker's Guide to the Galaxy series.